I know. I knowwww. We were doing so well in the kitchen at the cabin! Making great strides! And then, well, I’m trying to pinpoint where we got side-tracked. I think it was the delay with the appliances before Christmas (remember how I mentioned the cabin was in a no delivery zone?!). With no appliances coming for awhile and then suddenly an island arriving that wasn’t going to work, but then finding an island that would–also backordered. It felt like the right time to take a step back and breathe and work on other projects. Sometimes that’s all you can do. And sometimes that’s what we just need to do when we can feel ourselves headed in the wrong direction at full speed. Pivot! The good news is the appliances are here and they are amazing. This post isn’t about those (yet!) because we’re still waiting on a handle for the dishwasher and then I’ll show them off. Another pivot did happen with their arrival though. We realized the hardware on our cabinets were a little too yellow brass in comparison to the brushed bronze hardware on the appliances, so I ordered 13 of the same ledge pulls in black and I’m excited to swap them in. What else? The cabinet on the right of the range is finally in a permanent place (we had to wait for the range to be installed just in case), so we can finally trim that out and give the countertops a good oil to darken them. And probably what we are most anxious about now is starting the backsplash! It’s almost a running joke now because when we bought this cabin, in November 2017, this same Hardiebacker board was exposed. Unfinished. There were some upper cabinets hanging on it, but the cement board was just bare. You can actually still see the previous owner’s drawings on it! It’s a constant reminder of where we’ve been and we’re not going to pretend to be sentimental about the cement board at all. We can’t WAIT to get tile up. 2. 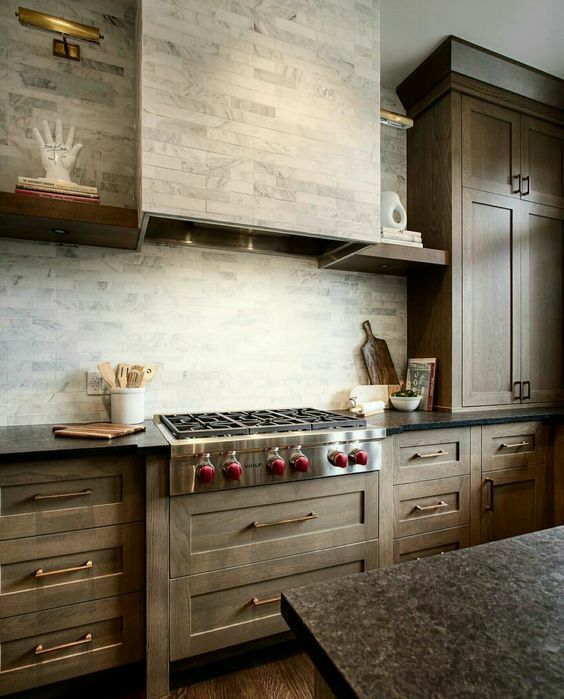 Do some sort of smooth white boxy cover with wood trim to match the cabinets like House Seven Design below. I like this idea because the wood trim feels cabin-y and cool. And I’m always about mixed materials. I’m hesitant because we can’t really go much wider than the range without crowding the sconces, so we might have to leave any cascading details off. 3. 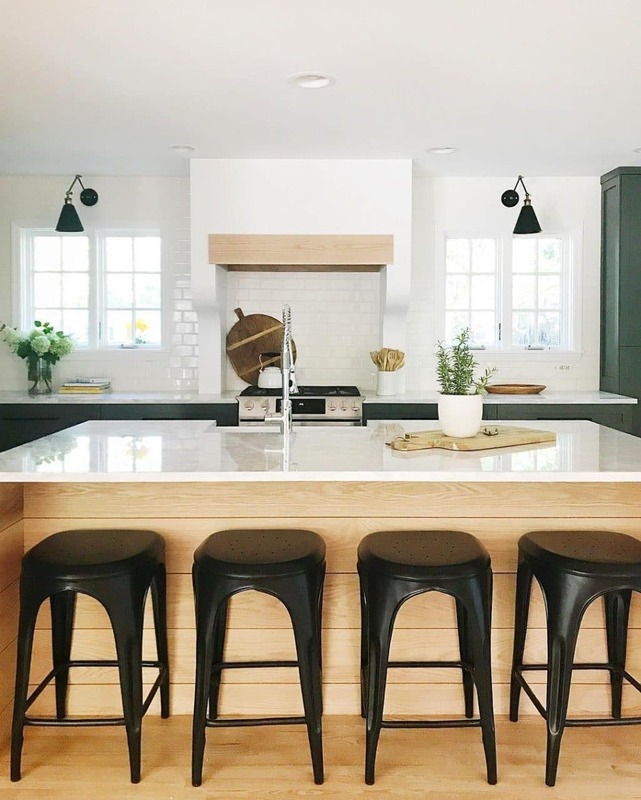 A coordinating black range hood like the kitchen from Amber Interiors below. This would definitely be the simplest option that just came up on our radar. Cafe (the makers of our appliances) makes a coordinating black range hood that looks very similar to the photo below. I like this option because it would bring some contrast to the white walls and because it’s the same brand, I can be confident the blacks wouldn’t clash. I’m hesitant because it’s the most expensive option (although I found one on eBay for cheaper). With the three options laid out, which would you choose? Oh Chris Julia Greta Faye and Polly. Like all your readers, I feel like you are dear friends. My heart aches at the news that your cabin is gone. We will all be here when you feel well enough to come back to this community. So grateful no one was hurt. Sending lots of love your way. It is a testament to your strong, sweet spirits that so many of us are with you on this journey. Encouraging, blessing, loving and praying. You will rise from the ashes, figuratively and in real life. “All things come to us for our good” may be hard to realize right now but I have every faith that the day will come for you. So happy you are all safe. Take all the time you need and know that your “people” will still be here when it is time. God Bless. Can’t stop thinking about you guys. This is heartbreaking as a reader, I can’t even imagine how you feel. Sending you love and prayers. I know you told us to keep calm and respect your mourning – and it is a mourning period. But, since you are reviewing our comments before posting, please help us to know that you are ok.
Give us a new post/picture as a signal that you are ok. I am seeing the same post and I worry – I’m sure we all do… Just give us a heads up that you are ok.
Love what you do and pray that all is well with your family. I never thought I would worry so much about people I don’t personally know. I’m so unbelievably sorry about the fire. Praying for you guys and hope to hear your doing ok soon. I would definitely go with the black! It’s heart breaking to think about what you all have gone through, and are going through. More than anything, I’m glad you all made it out safely. I wish and pray for healing for your family. Since reading about the cabin burning down, you and your family have been constantly in my thoughts. I keep picturing the amazing strides you’ve made with it, the beautiful things you’ve filled it with, the dance parties and big smiles on your girls’ faces, and my heart just aches for you. If I feel such sadness and loss for you, I can only imagine how your hearts must feel. Hoping you all get the closure and peace you need to move forward. Very sorry and shocked about the fire. I’m so sorry for the loss of your cabin and all the hard work you have put into it. So glad you and your family were safe. Sending prayers. I’m so sorry to read of the loss of your cabin. I enjoyed seeing your progress and shared many of the pictures with my husband. I’m praying for peace for your family. I am so sorry Chris and Julia for your loss. My heart aches with you. I lost my home as a child and I remember how devastating and shocking the experience was. I am keeping you in my thoughts. We are all very sorry and are feeling your pain. It seem so surreal that just the other day you were renovating the loft bathroom and now its gone. Like how? Why?? all the time and energy spent is gone. I am so sorry but in my heart I think this is a sign that you soon will find your forever home and will have the time to work on it instead of trying to do 2 big projects at once. We all are with you on this journey. My heart aches for you all. Sending you hugs. Perfectly said, Maya. This is exactly why I love following along on the Marcum family’s home adventures – it’s more about making a home than just making perfect before and afters. I am truly shocked and saddened over this loss, but know they will make something magnificent out of it for their future. Maya Every word you said is so true. Can only speak for myself but as much as I love their design skills, Chris & Julia’s relaxed lifestyle, focus on family and living in the moment is what keeps me coming back and following along with their lives. I saw the link to the newspaper story about the fire from someone above, and from the newspaper, a link to an interview the paper did about them a year ago TO THE DAY that the cabin burned. Life is just so fragile. Sending love and good thoughts your way. Chris and Julia, i’m so sorry. My heart breaks for you and your family. i have followed along your journey and can see how much sweat, hard work, love and care has gone into making the cabin a beautiful home to spend time with your beautiful family. I am glad that you have some beautiful pictures and memories to carry with you. God bless, know you are in our thoughts and prayers. What’s remarkable is spring of 2012 I went through a similar thing and it was also underwear when I finally lost it. Just something taken as always being there and suddenly you realize how fragile and despondent you can become in 15 minutes. To Chris & Julia things like this help to quickly put life into a very different perspective and make you have a deeper appreciation of things forever going forward. Thinking of you and your family – thankful you all were safe in your home. I was so sorry to hear about the loss of your cabin yesterday. Wishing you strength during this difficult time. I was so sorry to hear about the cabin yesterday. Wishing your family the best during this difficult time. I am so sorry for the loss of the cabin. I lost my home to fire 42 years ago, there is still an an element of shock all these years later. As I read through all the kind words from your “Chris loves Julia” world I see you have such a large group of people that care. My best wishes for you guys as you deal with this. I was so sorry to hear of your sad news yesterday. Cannot imagine the range of emotions you’re going through. Thinking of you and your family. I was so sorry to hear about the loss of your cabin. I’m thanking God that no one was injured. You and your family will always have the memories you made in that cabin. I don’t know if you are even reading comments this morning but whenever you do see this. Please know that my heart breaks for your lost. As others have echoed take care of yourself and your family at this time. I don’t know what grief you’re experiencing but I’m praying for you. Your friends (aka readers) will be here when you’re ready. We’re for you and your family at this TOUGH time. Dear Chris&Julia – I couldn’t NOT comment – I have to tell you how deeply sorry I am. We all know, as you do, that it is just a house and thank goodness for that. But as your readers, we have followed every detail of this journey that you have shared and we saw the time, effort, love and joy that went into making the cabin such a beautiful place for your families to enjoy. Know that so many of us are feeling for you all right now. There are no words to express my sorrow and sadness at the news of your cabin. Devastating doesn’t come close to describing it. I feel for you and your family during this time. We’re all wishing you the best during this incredibly difficult time. I saw your post on Instagram and thought how beautiful and serene the cabin looked, it was only this morning I read the post and I’m crying for you I’m so so sad. I’m so sorry for you both but so grateful your beautiful family were not in it at the time. Sending love to you all. So very sorry for you. Tough Decision!! I would go with #2. None of the options look bad, but I agree with you, you don’t have the ceiling height for #1 and #3 looks very traditional or blasé. We’re so very sad about your cabin burning today. We live Year-round in our cabin just uphill and to the north of your cabin. I went down to the highway and watched with tears in my eyes as the flames devoured your lovely cabin. I hope you recover quickly from the trauma and rebuild. So incredibly sorry to hear about the cabin. The work you put in and how much your family loved it there was so apparent to us all. Please rest, take some time for yourselves, and let us know how you are doing when you’re ready. What awful luck for people who deserve only the best kind. I can’t seem to find the words. Like probably all of your readers here I feel like we are friends. So knowing your friends are going through such devastation is heartbreaking. You are such a sweet and lovely family. I’m sending love and really long tight virtual hugs. Julia, I am shocked and heartbroken over the loss of the cabin. I’m so grateful you and your family weren’t there at the time. My heart is with you. So sorry about the fire. I’m so glad you all are safe. Devastating, you will really need time to recover from this. I recommend talking to a counselor for you and your kids, because this is traumatic. Option #3 for sure! I am all about saving money. However, I think the money will be well spent on a cooridinating black hood. Despite never meeting you, my heart, along with all your other readers is aching for you. We all feel like we know you and love you. Just so grateful that you, Chris and the girls were not in the home when it happened. Prayers going out to you for peace and thankfulness for your safety. Heartbroken for you guys. There was no wrong decision. I have no doubt that whatever you decided to do would have been beautiful. My heart is aching for you all. I vote to build a box and tile it. 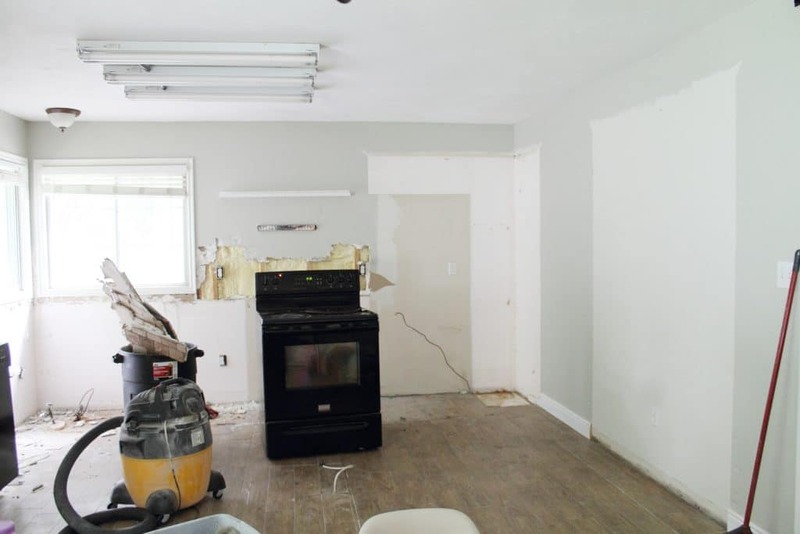 I feel like this small space kinda already has a lot going on with the floors, cabinets, counter, and island. And then the finish on the appliances too. So I say don’t add anything else! I love your willingness to pivot on a project! Another vote for option 2. The other options just seem too visually heavy. Julia and Chris, I’m so incredibly heartbroken and sad to hear about your mountain house. Thank god all of you were able to get out safely. I honestly can’t even fathom what you must be feeling. I’m so so sorry. So so sorry to hear about your news today. My heart is broken for you. Just devastating. So so grateful you are all ok. Praying for you and thinking of you. Just saw Instagram. I am deeply saddened you lost the cabin to a fire. You are in my thoughts and prayers. So so sorry to hear about the cabin. I’ve obviously never met you IRL but my stomach dropped when I read the news and my heart absolutely aches for you and your family. *Not sure if everyone on your blog also follows along on social media, but the Marcum’s cabin was lost to a fire this morning. I’m dying to know what the cabinet configuration to the right of the range will house. I’ve built many an ikea kitchen and I don’t think this is standard configuration, very curious! Option #1 – tile to match the walls! I think that way, the range hood box will just disappear into the surrounding tile. Nice and uniform for such a small space with a lot already happening. Loving what you have so far!! I would do the black range hood. I feel like the tiled hood boxes always end up being really large, and it would overwhelm the small space. If that’s not possible I’d do the tile (option 1). The timing of this post is so beyond tragic. I can’t believe the A frame burnt down. I hope you guys rebuild something amazing in it’s place! Question: Are you only able to have that style hood or do you just not like the look of the wallmount/chimney style hood that Cafe also makes? 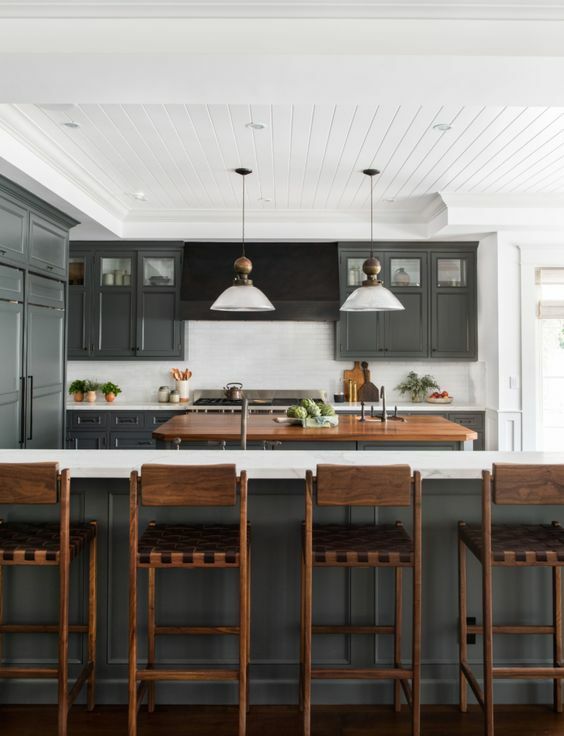 I just think the size of the hood in your inspiration pic would end up being too much black for your space because of the size of the wall behind it and ceiling height- but agree that the added contrast could be beautiful. Is there an option D, all of the above? I think I’m leaning more towards 1 because it’s beautiful and neutral and will look more seamless. I think showing restraint/less is more is probably the best option here- especially given the quality and beauty of the tile. I would choose your first idea, to tile the hood. It will help it visually disappear at the same time, a good solution for a small kitchen. The 2nd idea will be too obtrusive functionally I think, and the third option of the black hood works in the source photo because it blends into the line of the upper cabinets, which you don’t have. Have you picked the sconces yet? Would that help your choice? I was going to say the black hood would be a nice accent, but I really like the idea of the tile. Curious to see how that would look! At first I liked the idea of the tile, but after taking some time to think about it I like the black hood. It would make a statement and it would show off the contasting tile nicely too. You know your space best though! The tile!! All the way. Are you not allowing your posts to load in feedly anymore? I would hate to have to stop reading. I’m voting option 1! 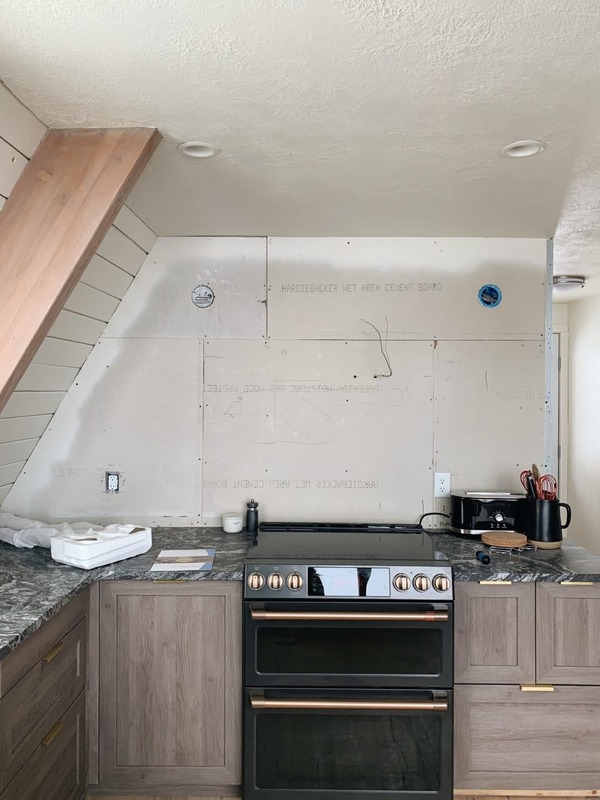 I think especially with the angle of the cabin in the kitchen the black range hood would be too strong and make that area where the sconce sits feel too tight. I hope that makes sense. And I don’t like option 2 for this application for exactly the reason you stated, the “swoop” part wouldn’t be able to be there so I think it looses it’s luster, once you take away that swoop you might at well do the tile option. Everything is coming together beautifully! My first thought was the black hood all the way. But then I realized that I was picturing the black hood with the current yellow brass pulls. When I picture the black pulls, and those counter tops, suddenly I think a black hood may be too much black and feel too heavy. So now I’m thinking the tiled option with black and brass sconces on each side. That way it ties everything together but it won’t feel as heavy. I know what ever you decide I’m going to think, “oooohhh, I like that!” Haha. So I cant wait to see what you decide. I just saw your instagram post and had to come back to your site to see if maybe there were any updates on the fire. I am so shocked and so saddened by this news! I’m sure you are still sorting out the damage and what this means for your family. Sending you positive thoughts as you navigate through this difficult time. Here is a big virtual hug from San Diego. I think I would go with #1! I’d go with the tiled option. The others are beautiful too but the space is so small and with so much else going on already, I’d choose to keep it simpler. I think I like option 2 most because it will look most custom when you’re done…but I understand that makes it the most difficult, so I’d have to weigh that in the decision! I love the “mantle”-esque look of it, though, super cabin-y and unique. I like the tile option best I think! Its a much smaller space than the last two images and I”m concerned it won’t flow as nicely in your kitchen! I look forward to seeing what you choose! I vote tile. Let the cabinets and countertop be the focal point. With the kitchen being smaller you want those elements to shine and not fight for attention. Plus the new island will bring a good pop of black and I think the entire wall being tile will make it feel taller rather than breaking up the sightline. Good luck! I like #1 or #3. One thing with the tile option is that your mitred corners are going to have to be on point, which can be challenging. I’m very curious how necessary a hood actually is, or if you are incorporating it mainly as a design element. I cook on our stove every day usually for two meals and have never had a hood. The reason I ask is because I think that wall would look beautiful with one long open shelf going across. I know you planned for two sconces there but I think it would still look beautiful with a shelf. I think a hood would just be this big monstrosity breaking up an otherwise clean and simple space on a small wall. Of course I’m just a person on the other side of your computer screen, but it feels like you’re forcing it a bit. So maybe just ask yourself if you’re forcing this decision? #2 is my favorite…even without the cascading element. Tile! Really unique, simple, stunning. Although at first I was also considering the black hood- I think without upper cabinets it will stand out too much. I’d tile the hood BUT I’d add a piece of your cabinet wood to the bottom edge across the front and around the two sides of the hood. It would look *a little* like option 2 but without the decorative pieces coming down the wall. 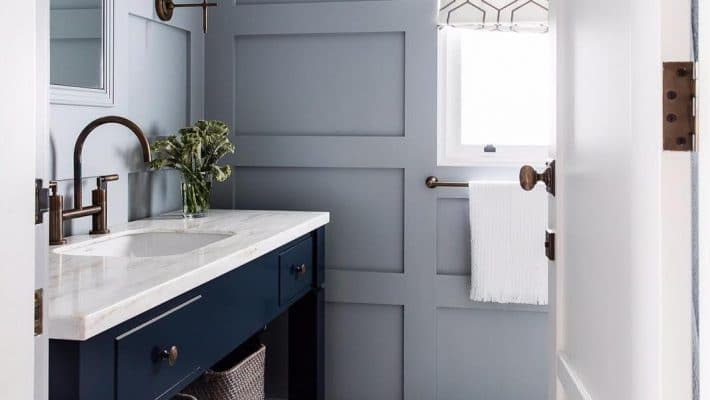 I like this option because it will tie in your cabinet color on an all white wall giving it some contrast and it gives a nod to the cabin vibe vs a more contemporary look with all tile. It’s been so fun to follow along on the cabin. It’s looking so great! I’d tile the hood but add a piece of your cabinet wood along the bottom front and sides to tie in the cabinets and their color. I think wood on the hood brings in the cabin vibe more vs an all tile hood which is more of a contemporary look IMO. It’s all looking SO great…so fun to follow along! I can see why you are having a hard time deciding! They are all fabulous ideas and have pros for doing each one. I think the tile will look the best given the small space. I vote the black range hood second. I think the box idea would be great if the space was bigger. Is it possible to do an exhaust fan that is flush on the ceiling above the stove, like a white grate that blends in and then just a solid wall of tile? Perhaps then you could put an amazing piece of art between the sconces? I needed to come back and tell you how heartbroken I am for you. We recently had a house flood (and by no means is it near what you experienced), but I know how violating, overwhelming, and heartbreaking it is to find your house damaged (or gone) from something. I am so so so sorry…lean into your village in this time. We’ll be here when you come back, but feel the freedom to be absent and hold each other close. I say go with your initial gut! Love the idea of the tile and I think it will really help to make the space seem bigger while also providing a beautiful statement wall. While I like both the tile and the black hood, I think the tile will make that wall one statement as opposed to breaking it up the way the black hood will. I just think the wall is too small to be broken into 2 smaller statements. I know anything you do will be beautiful and I will end up loving it. One of the earlier comments summed it up well–what do you want to be the focal point in the room? If it is not the hood, then go with the tile so that it blends and is masked. I totally agree with this comment! The black pulls are going to look perfect, I love seeing your progress and the hows and whys of your decision making. One question though, the height of the range next to the countertop…..Can that be adjusted? The range top looks higher that the counter and that would drive my detail-loving brain crazy and make cleaning more difficult. I have noticed that on other kitchens as well and wasn’t sure if that was the cabinet height, the depth of the counter surface, an appliance without adjustable legs, a total oversight or just a mid-progress detail yet to be tweaked. I will be using the Semi-Handmade/Ikea combo as well in our new home and am curious if this is something I need to plan for? I like option 1 the best, as you said it’s a small wall and the tile should be the star! Also the 3rd option in your inspiration pic is nestled between upper cabinets which kind of “ground” it, not sure how it would look to just have a range hood floating on the wall with no cabinets. Definitely the tiled option! I really don’t love the look of range hoods and in a small space it would get all of the attention compared to the rest of the beautiful kitchen! The black!! I don’t think the space is big enough for the other two options. Black hood all the way! My preference would be option #1, I think that would look wonderful! My concern with option 2 would be – which wood trim wood you try to match? The cabinets? The floor? The beams? Right now all the wood is a little different but coordinates well, and I personally wouldn’t know which to highlight in this fourth space. And I agree with a couple others who mentioned that the black hood would draw more attention than you really need to that small space. I would go with the first option. As you say, it’s not a large wall and the ceiling isn’t very high. I worry the other two options would just highlight that fact. A tiled hood will keep the wall seamless but still show off the tile you’re so excited about. A black range hood is heavy visually and might compete with the sconces you have chosen, not to mention the island. Plus, I think a tiled hood will look the best with the white ceiling throughout the rest of the house — it will keep everything light and airy at eye level. With such a small area, I like the tile option for the vent hood. I always think of how easy is it to clean? Tile above a stove seems like a nightmare so I would get the range hood! But they are all beautiful options! The black range hood would be my first choice. I love the tiled or black hoods! I feel like I’ve seen the wood trim hoods too many times, maybe? It doesn’t feel as fresh and exciting to me. But I do see what you’re saying about it working for a cabin. I’m sure it’ll be gorgeous— your work always is! I think the black hardware will be great – I do love the counter top, which looks fantastic with the black stovetop, however to my eye, the cabinets and counter seem disjointed, so the black will hopefully draw them together (I think there is quite a lot of “movement” in both surfaces which may not photograph well). Looking forward to see how the backsplash ties things together! I think #2 gets my vote! But of course, you can’t go wrong with any of the choices. Can’t wait to see the kitchen come to life. In this case I would tile- and I am generally all for statements and contrast! I think in your kitchen, the range hood (which is sounding very minimal and square) is no where near the most special moment, so why draw the eye to it? Save the contrast for the gorgeous counters and wood! Go with the black hood. It will balance that wall. I really like option number 3. I think it would make the hardware on the range stand out beautifully! Tile the hood 100%! The other options would render the tile really visually inconsequential, to the point of “why even bother?”. Tiling the hood with that gorgeous tile will look FANTASTIC! Can’t wait to see the finished product! When I run into questions like this, I always ask myself if I want that piece/detail to be a focal point or not. I like the first option the best to keep the focus on the island and appliances and to not visually crowd the space. I would normally vote against this option, but I suggest option 1. The wood trim would not make a strong enough statement to stand on its own with the cabinets and views. The range hood would be too heavy visually for a small wall. I will definitely notice the small wall with it hung there. The tile option would allow the hood to both recede visually as to not overpower the wall, and it would draws focus to it as a statement due to the projection of the vent hood from the wall.